British Steel will step up production of its revolutionary Zinoco® rails after the ultra-long versions of the product received full approval from Network Rail. The manufacturer is investing a seven figure sum in new plant that will enable it to produce the premium coated rail in lengths of up to 108 metres, and welded lengths of up to 216 metres. Zinoco®, the name of which derives from the words ‘Zinc for no corrosion’, is a world-first which can withstand the rigours of being laid in some of the most challenging rail environments. Its installation reduces the need for costly and disruptive rail replacement programmes in highly corrosive areas such as coastal lines, wet tunnels, level crossings, mineral lines and salt pans. Peter Smith, British Steel Managing Director for Rail, said: “Zinoco offers superior corrosion protection compared to all current rail coating technologies on the market so we’re delighted Network Rail has given it full product approval up to lengths of 216 metres. 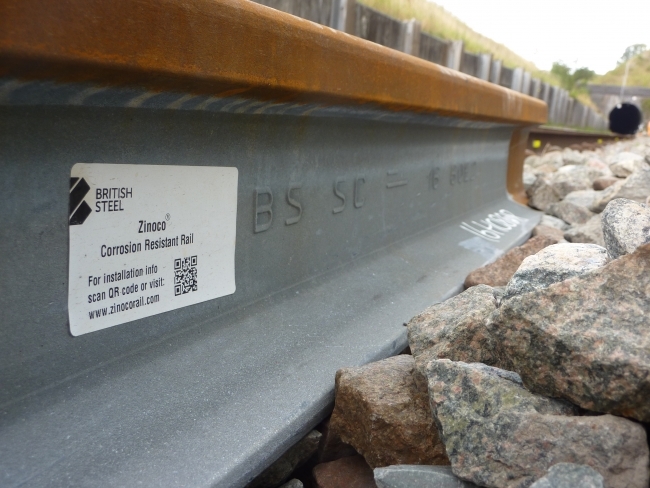 British Steel designed Zinoco® in conjunction with Network Rail and initially made deliveries in lengths of 18 metres before a series of trials were conducted with longer lengths. The reduced number of welds longer lengths require not only speed up the installation process but give the rails greater integrity. Over the last 18 months longer length rails have been installed in tunnels near Bristol and Fife, culminating in Network Rail granting full product approval. Work is already underway building the new plant to start production of the ultra-long Zinoco® rails in Scunthorpe. It’s anticipated it will be commissioned this Autumn. Peter added: This investment underlines our commitment to innovation and the highest levels of product quality and service delivery.